Singapore Adapter Plug Kit has the adapters you will need for traveling to all parts of the gorgeous country of Singapore. Grounded and Ungrounded plugs, what is the difference? Singapore is located in Southeastern Asia near Malaysia and Indonesia. The Deluxe Singapore Adapter Plug Kit ships Priority Mail with tracking so you will have your adapter plugs to you in time for your trip. The Deluxe Singapore Adapter Plug Set comes with a total of six adapter plugs and includes grounded and non grounded adapters. The Standard Singapore Adaptor Plug Set comes with three grounded plug. The Basic Singapore Adapter Plug Kit comes with three non grounded plugs. If you are not sure whether you will need a grounded or a nongrounded adaptor plug, you can watch Going In Style's Adapter Plug Video showing the difference between grounded and non grounded plugs. The Singapore adapter plugs allow you to plug your United States appliances and electronics into Singapore wall outlets. Singapore operates on 230 volt electricity and is generated at 50Hz (Cycles) Alternating Current. United States 110-120 volt electricity is generated at 60Hz (Cycles) Alternating Current. This difference in cycles may cause the motor in your 60Hz United States appliance to operate slightly slower when used on 50Hz foreign electricity. Most modern electronic equipment including battery chargers, Lenovo, HP, Asus, Toshiba computers, iPods, etc., will not be affected by the difference in cycle. Singapore is located in Southeastern Asia, islands between Malaysia and Indonesia. Its climate is tropical; hot, humid, rainy; two distinct monsoon seasons - Northeastern monsoon (December to March) and Southwestern monsoon (June to September); inter-monsoon - frequent afternoon and early evening thunderstorms. The terrain is lowland; gently undulating central plateau contains water catchment area and nature preserve. Currency in Singapore is the Singapore Dollar (SGD). Credit cards are widely accepted throughout Singapore, however smaller establishments might only accept cash. Foreign currency and travelers cheques can be exchanged in banks and money changers. Singapore has excellent telephone service and excellent domestic facilities; launched 3G wireless service in February 2005; combined fixed-line and mobile-cellular teledensity is 200 telephones per 100 persons. When travelling to Singapore you will want to take an international or unlocked cell phone with a prepaid Singapore SIM card. You can also contact your mobile service provider to set up an international calling plan. You will need an adapter to charge your phone. Most cell phone battery rechargers should be multi-voltage, therefore will not require a converter. If the charger says 100-240 volts, 50-60 cycles then your charger in multi-voltage. 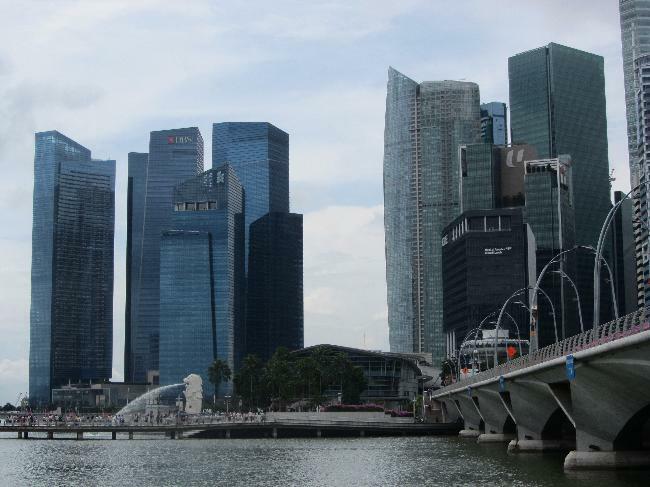 Singapore has 1.932 million internet hosts and over 3.235 million internet users and multiple providers of high-speed Internet connectivity and the government is close to completing an island-wide roll out of a high-speed fiber-optic broadband network. High speed internet is available at hotels and there is free Wi-Fi available in almost all major cities. When traveling with your laptop or iPad you will need an adapter to charge your device.